You may have heard that series wound DC motors, electric motor brushes and regenerative braking don't work well together. Common wisdom is that if you want to use regenerative braking, you need a 3-phase AC motor in your electric vehicle instead. But that left me wondering - why? 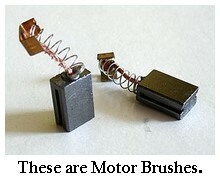 Is it the fact that series wound DC motors have brushes, and brushed motors simply don't do regeneration well? Is it that the brushes in our familiar series wound DC motors are often in the advanced timing position? Or is it only the sophisticated control system that comes with the AC motor makes it easy and efficient to use your electric car's motor as an electricity generator - while the less-complex DC controller can't manage it as well? I talked with Dr. Paul Pancella - whose Hondatron has both excellent regenerative braking and motor brushes...oh, and a (per-mag) DC motor controller, too! I'm hoping to clear up a couple of my misconceptions on the subject of electric motor brushes and regen braking. Lynne: Welcome back, Paul. Let's talk about motor brushes and timing position, and how that relates to regenerative braking. I've always thought - wrongly, I guess - that the reason our familiar series wound DC motors didn't do well with regenerative braking is because of the brushes. One, because they have brushes, and for some reason electric motor brushes and regenerative braking don't mix; and two, the brushes in our series wound motors are almost always advanced, and advanced timing isn't compatible with regenerative braking. For example: reclaimed forklift motors. The series wound DC electric forklift motors that some people use for their EVs are advanced because they're originally rated for very low voltage, and are used with very low voltage system in the electric forklift. The brushes, when they remove the motor from the forklift, are usually in the neutral position; we advance them so we can use them in higher voltage systems. 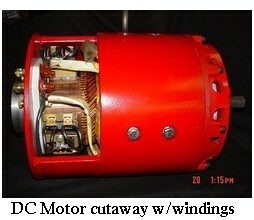 Paul: Permanent magnet DC motors and series wound DC motors both use brushes. These brushes can be "advanced" (which means rotated from their neutral position) in order to decrease arcing under high power/load conditions, and thus squeeze more performance out of a motor at higher than its rated voltage. If the motor has enough power at its normal rated voltage, then this timing advance is not necessary. You are correct to quote Metric Mind that brush advance is not compatible with regenerative braking or electric reverse; but brush advance is not always necessary. The Hondatron with its Lynch motor 2x2 configuration runs just fine in the neutral brush position and gets excellent energy recovery by regenerative braking. You're saying brushes are not a problem with series wound DC motors if they're in the neutral position? But then why do we never see series wound DC with regen in EV conversions? Is it only the controller? How can this be, if they are using the Curtis boxes for regen with the AC-50 systems from HPEVS? 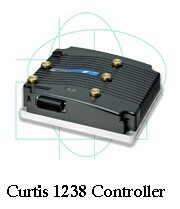 The Curtis controller for an AC motor (1238) is very different from the traditional Curtis for series wound DC (1231). 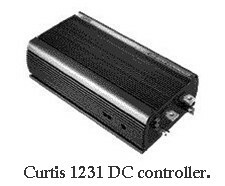 A "controller" which allows DC from a battery to run an AC motor is really a high-powered inverter with adjustable frequency. An inverter (DC -> AC) is the opposite of a rectifier (AC -> DC). If you want to do regenerative braking, your controller has to be designed to do it. Neutral-timed brushes are not the problem. You get regenerative braking by using the motor as a generator. In principle, the same physical device can be run either way. If electric current is supplied to the device from some source, electrical energy gets converted to mechanical energy, rotation with torque, and we call it a motor. If mechanical energy is supplied to the device by forcing it to rotate (with no electrical supply) then electrical current is produced, and we call it a generator. If an EV is in motion, and the motor is coupled to the wheels, the momentum of the car will force the motor shaft to turn even without any electric current supplied. A smart enough controller can then take the resulting electrical energy and force it back into the battery. How does the motor work as a generator, and why don't series wound motors function this way very well? The principal of generating electric current is very simple: move a wire loop through a magnetic field (in the right direction) and current will flow in the wire. The problem with the series-wound DC motor is that if you cut the electric power supply, then there is no magnetic field for the coils to spin through! (Remember, the magnetic fields on both the stator and the rotor are produced by current in coils when it is run as a motor.) You can get around this problem if you can send a little current (excite) to one of the coils to get it started, but it is hard to control this and keep it stable. If the rotor has permanent magnets on it, then no problem, the electric current produced is a nice linear function of how fast the rotor spins. The brushes make the current come out as DC. I believe the new generation of AC motors being used in EVs also have permanent magnets in them, and so easily generate current (AC) when spun during braking.